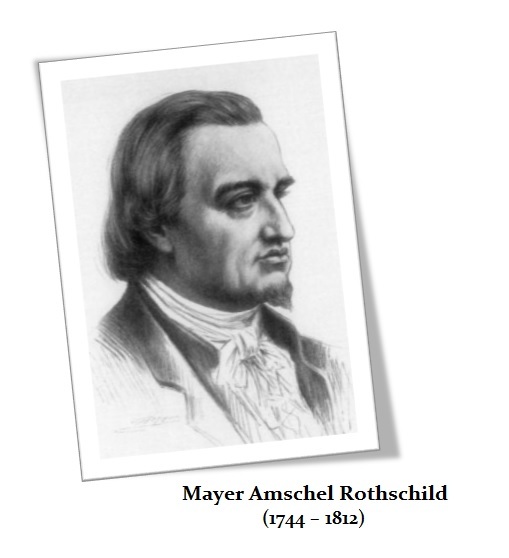 QUESTION: You defend central banks yet the Rothschilds when clearly Mayer Amschel Bauer Rothschild said: “Give me control of a nation’s money and I care not who makes it’s laws.” Any comment? ANSWER: No problem. He never said any such thing it was completely made up. It was attributed to him in 1838 when he was already dead for 26 years. Besides that, what is very clear is that this is based on the assumption that money is fiat. The USA began to issue paper money in 1861. During the period that Mayer lived, the money supply was primarily coined. The only plausible reference would be implied that he debased them. He was a banker and never produced the coinage. It would be nice just for once that you bothered to actually understand the role of central banks as originally set forth. What they do today with Quantitative Easing has proven that the entire theory of an increase in money supply will be inflationary is outright BOGUS. In every case of HYPERINFLATION, not even once did inflation ever begin by increasing the money supply. Inflation begins when PEOPLE lose CONFIDENCE in the government and they spend the currency as fast as they can or outright refuse to accept it. I have explained that the Japanese Emperor used a different approach. He DEVALUED all outstanding money to 10% of his new coinage. That led to the collapse in CONFIDENCE to the point that the people never trusted the government and as a result, the Japanese lost the ability to produce money for 600 years. The definition of what creates inflation is entirely wrong. Even Gresham’s Law needs to be placed in context. Gresham worked in the foreign exchange markets in Amsterdam. 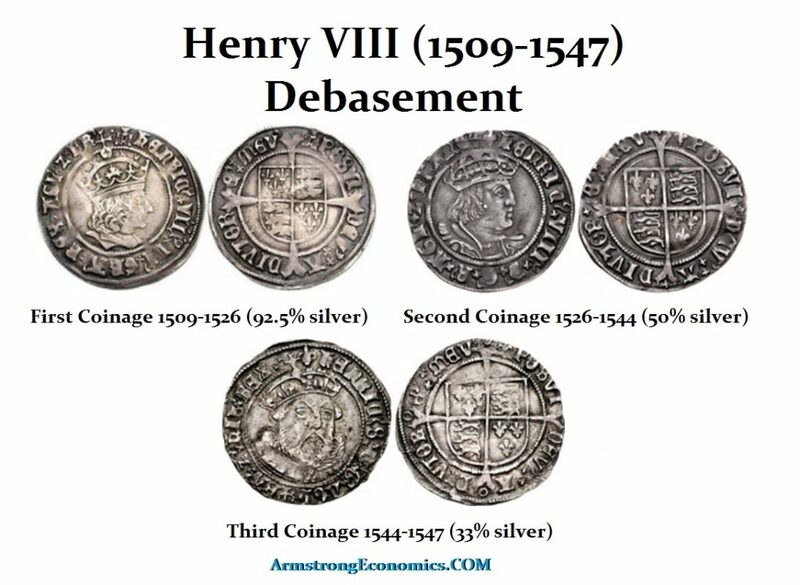 Henry VIII debased the English coinage. But coinage traded on foreign exchange markets according to its metal content. The inflation Gresham referred to was experienced in the foreign exchange markets so what he truly observed was the decline in the British coinage value on international markets. Don’t forget, this predates the central Bank of England which was established in 1694. The entire observation of inflation began with Gresham. However, it was extended by David Hume (1711-1776) who made observations BEFORE paper money began. This observation is not respected even today. David Hume showed why net exporting in exchange for gold currency, which then increased the domestic money supply and was hoarded by Britain, could not actually enhance wealth. Hume’s argument was essentially the monetarist quantity theory of money which would influence others over time. Prices in a country would change directly with changes in the money supply. Hume explained that as net exports increased and more gold flowed into a country to pay for them, the prices of goods in that country would rise with the economic boom. The USA saw this through the course of World War I and World War II ending up with 76% of the world’s official gold reserves. Consequently, an increased flow of gold into England would not necessarily increase England’s wealth substantially was Hume’s argument because the increase in domestic prices due to the gold inflow would discourage exports and encourage imports. Hence, this trend then counter-reacts with trade and automatically this will start limiting the amount by which exports would exceed imports (high currency decline in exports). The more money that flowed into a country, like the USA, the higher the prices and this would then reduce exports. Adam Smith’s attack on mercantilism and argument for free trade strangely ignored Hume’s argument. Hume’s view of capital flows can be verified throughout history and is really the underlying foundation of the balance-of-payments issues that Trump fails to understand. Hume also advanced the idea of “creeping inflation” that takes place with a gradual increase in the money supply that would lead to economic growth. This is largely correct, but money supply growth must also keep pace with population growth or you will produce deflation – more people and less money to go around. With the introduction of paper money during the mid to late 18th century, the relationship between the over-supply of banknotes and a resulting depreciation in their value was noted by earlier classical economists such as David Ricardo (1772-1823). However, the issue of paper money during the American Colonial period must also take into consideration two factors: (1) England starved America and extracted coin money assuming they were using Spanish coinage, restricting payments to American to copper coins only, and (2) the American Revolution which was funded by creating paper money. There was again a lack of CONFIDENCE to the extent that when the American Revolution ended, the Constitution prohibited States from issuing money again and federally no paper money was issued again until the American Civil War in 1861. 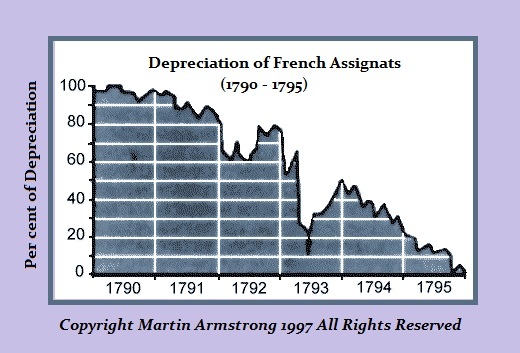 The French HYPERINFLATION was again caused by a Revolution that chopped off the heads of the rich and even seized all the property own by the Catholic Church. The theory of COMMUNISM came from the French Revolution. The Commune Movement began then and there. This resulted in the rich French fleeing to Geneva in particularly and you ended up with a similar set of circumstances as the 1918 German Communist Revolution that created the German HYPERINFLATION followed by the rise of Hitler whereas the French moved through the same pattern and ended up with Napoleon. Therefore, most HYPERINFLATION periods are associated with war like the American and French experiences and/or a collapse in CONFIDENCE in the government. Attacking the rich ALWAYS collapses the economy and has resulted in HYPERINFLATION in one form or another (see also Maximinus I of Rome). However, turning even to Lydia, the very first government in Anatolia to issue coins, we see the debasement unfold as a direct result of the war with Persia. 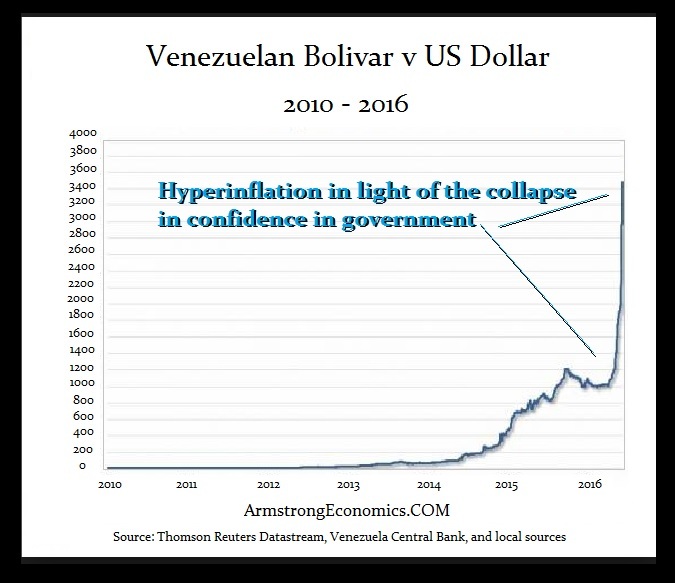 Therefore, there is no evidence of HYPERINFLATION unfolding absent a collapse in the CONFIDENCE of the people in that government that is typically associated with war and a change in government. If the Democrats were to sized control and raised taxes dramatically in the USA, you would end up in HYPERINFLATION and capital would withdraw. I myself would simply stop doing any business and retire. In the case of Venezuela, obviously, there has been a collapse in CONFIDENCE. The same was true in Zimbabwe after it seized all the property of white farmers. Foreign investors refused to ever participate again. Therefore Quantitative Easing complete FAILED to produce inflation no less HYPERINFLATION as the goldbugs forecast because inflation is not created by a simple increase in money supply. It is created first by an economic boom where people spend freely (creeping inflation) and it will turn to HYPERINFLATION when CONFIDENCE collapses and people NO LONGER trust government.